Before we start I need to warn you that the modification discussed here will change Author name to all your posts in the blog, so this tutorial is for those blogs with a single Author. As always when doing any modifications to the blogger template, your first step should always be to backup your current template . Go to Dashboard > Template and on the top right corner click on Backup / Restore button and choose Download full template. Still on the Dashboard > Template click on Edit HTML button. Code for your template will show up. Now you have to search for data:top.showAuthor in the template. You should find two instances of data:top.showAuthor in the template. First one is for Desktop devices and the second one is for Mobile devices. Now all you need to do is replace <data:post.author/> with a static text that you want to be displayed as Author Name. Regarding the link you can either comment out anchor tag <a> to remove the link from your Author Name or just change href attribute so it doesn't point to your Google Profile. You achieve that by removing data:post.authorProfileUrl and in its place put URL you think is appropriate, for example URL to your Facebook or Twitter profile. Note:Remember that the above changes of Author Name will happen on all the posts in your Blog. Find the second instance of data:top.showAuthor and repeat steps 6 and 7. As mentioned before that second instance is used for mobile devices. 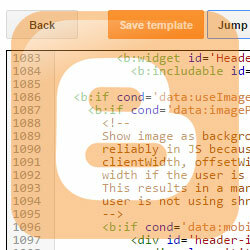 If you cannot find this second instance, just skip this step as your template might be lacking mobile template code. First I commented out the Author code <data:post.author/> and in its place entered word "Author". Regarding the anchor tag <a> I changed the link so that it points to my Google+ Page for this blog instead of my Google+ Personal profile Account. Just put the above code in the bottom of the template before closing </body> tag and replace values for myanchor[i].innerHTML and myanchor[i].href to your desired Author Name and URL. To make this also work on mobile devices, change your mobile template to Custom template. This way, it will use the mobile part of the same template that you just modified. There is another part of Blogger that will continue to use our G+ profile whether we like it or not and that is in the comment section. We will get rid of the Google+ profile as an Author Name in the comments using two different techniques. Neither of the two solutions described in this article is a perfect fix, as both have their drawbacks, but when you do not wish for your Google+ profile to appear anywhere on your blog, every little bit helps. One way to fix the problem is to replace default Blogger comment system with a third-party comment system. I tested two of them. Note:Always create a backup of a template before switching to other comment system in case you change your mind later and want to switch back to the default blogger comment system. How to back up a template is described in step 1 of Solution 2. This comment system is appropriate when you do not have any comments yet. 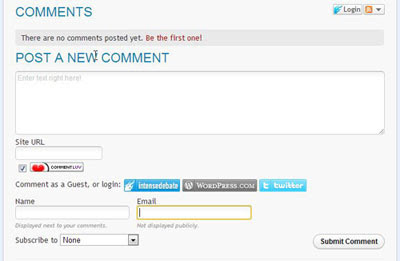 It does not support import of existing comments and those posts that already have them will continue to use default blogger comment system instead. On the plus side it does have a lot of useful features, among them ability to install additional plugins like commentLuv. This one does has an option for importing already existing comments, but you will not be unable to edit them, so your Google+ Author Name will be preserved. On a plus side, the link to the Google+ profile will be removed, so if you have a popular Name, having an Author Name displayed might not be such a big deal. Still on the Dashboard > Template click on Edit HTML button and then on Proceed button. Code for your template will show up. A little explanation of the above code. The second code in step 5 does almost the same but for img tag. Nice tips, will try later. Thanks! Liked the article. But one this I wanted to know apart from this. How can I also change my name in the comments. 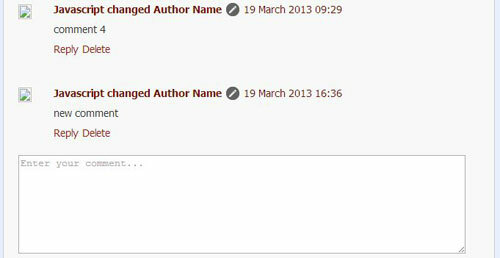 It is still showing me as the author while I reply to people comments on my blog. I just added new post that deals with this specific issue. How to fix author in comments. Link is in the UPDATE section at the end of this article. Thank you for your very helpful article. I visited here twice to restore the original style. I was very annoyed about my name is shown on my post. Nowhere I could find to fix it. So I corrected it according to this post. But few days later I found that it is because of the Google+. There was no choice to hide my real, full name if I use(never used but pressed yes on certain popup) Google+. So I deleted my Google+ account and using older style blogger id. Older syle is much flexible(at least on changing the author name at blogspot), how ridiculous! Thank you very much for taking time to make a comment. When this blog was on Blogger Platform I too was annoyed when linking G+ account to the Blogger caused the change in Author information. They should give user an option to turn off this behavior. Nope, just cannot get this to work. I have G+ account associated with my blogger profile and cannot get it to change from being my name and link to my G+ profile. Trying to change to a different name with a link to a Twitter profile. Changed as you have described above and no joy... I seem to have a couple of extra lines in my code? And just to add, even with copying your code and pasting into the two locations it still comes up with my name! Got to love Google + ! Can you provide me with your URL (you can send it to me using contact form), so I could check it out. Ah! If this helps, it works in simple views, but does not for dynamic views. Does this help? I don't know where to look to change for the dynamic view! Yeah, all my blogger related posts are for simple views, not dynamic views. I just created a testing blog with a dynamic view and in that section related to displaying author link the code does differ a little,so tomorrow I will try to make it work for dynamic templates too. I updated this article to include the solution for Dynamic Templates as well. I hope it will work on your site. Also thank you for bringing this problem to my attention. I have a related issue which is that I cannot make the author name to appear at all. How do I make it show on the first place? I never had this problem myself. If you would send me your URL using contact form or email, I will check it out and maybe I will be able to help you . I would also like to have the ability to comment using some custom name instead of my G+ profile, for example posting a comment as my G+ page would solve this issue. Unfortunately it doesn't seem that this is possible at the moment. Wow! The script worked. That was much much easier! Thanks so much for posting this! I just checked HTML code of Ethereal template and it seems that Author Profile part of the template is the same so the solution mentioned on this article should work too for Ethereal templates. Let me know if you have any problems. Followed all the steps. My author name doesn't appear online. But I can see my author name appearing in RSS Feeds. How to hide that? Hi. I looked into it and I don't think you can change RSS feed directly, but maybe you could accomplish that with free web service like Yahoo Pipes. Hallo there. My blog url is http://www.adiewcen.com. How to change comment author from G+ Profile to my About Page? On Post Author, i've done this. I change the link of posts auhor from G+ Profile to my about page. But i can't change it on comment author. Can you help me? Thanks before. If I understand you correctly, you want to change Google+ Author Profile in your comment section. If this is the case, there is a section in this article that has been additionally added that deals with this exact problem. Followed all the steps. My author name doesn’t appear online. But I can see my author name appearing in RSS Feeds. How to hide that? I don't think this is possible. Only option I can think of is to disable RSS feeds all together by going to Settings > Other and set Allow Blog Feed to false. Here is some discussion I found on Google Product Forum about the same issue. Nice information. It helped us.